The Safe Food, Fair Food (SFFF) project is promoting food safety in informal markets through the application of risk-based approaches. In Uganda, the project is aligned with work on developing smallholder pig value chains (SPVCD). Assessments conducted in 2012-13 by the International Research Institute (ILRI) and partners showed that the pig industry in Uganda is largely informal and the capacity of actors at every node of the value chain is limited, thus constraining the performance of the value chains. To address this shortcoming at the slaughter and processing node, a five day hands-on training on “Harvesting in the Smallholder Pig Value Chains in Uganda” was organized by the project partners of the FAO Reference Centre for Veterinary Public Health (VPH) at the Faculty of Veterinary Medicine of the Freie Universität Berlin (FUB) and ILRI-Uganda, in collaboration with the College of Veterinary Medicine, Animal Resources & Biosecurity (COVAB) at Makerere University, Uganda. On 7th and 8th April 2014, we brought together parties with an interest in the safety of pork products in Uganda for a stakeholder meeting. More than 30 participants represented most of the actors in the value chains: pig farmers, brokers/transporters, slaughter house and formal processors as well as representatives from policy, research, capacity building and investment partners. The meeting started with a formal opening by ILRI’s country representative, Dr Danilo Pezo, and an opening speech by Professor Michael Ocaido, Head of Department of Wildlife and Aquatic Animal Resources at Makerere University. The opening ceremony was followed by a `world café´ style discussion where the group discussed some vital questions on pork safety in Uganda to set the scene for the workshop. 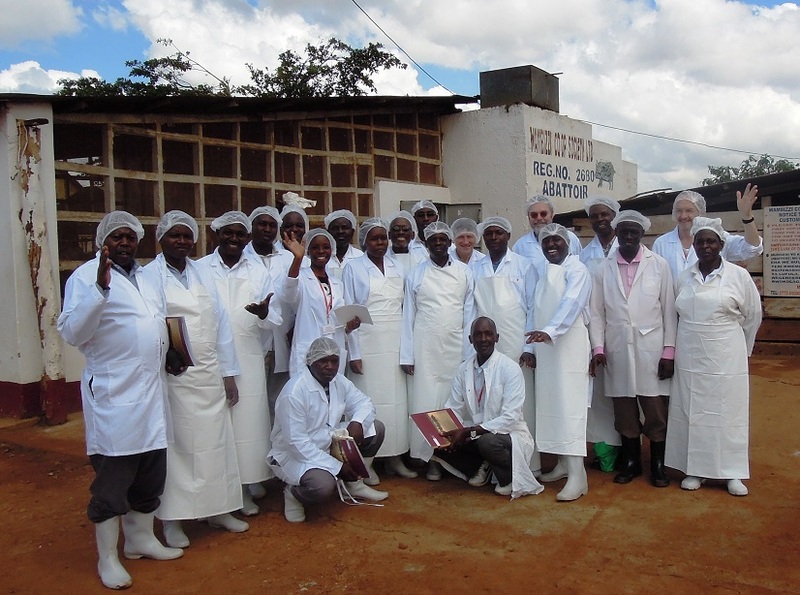 A training workshop on meat inspection was held on 7-11 April 2014 in Kampala, Uganda. Trainees included representatives from the ministries of health and agriculture, the Kampala Capital City Authority, local governments in Kamuli, Masaka and Mukono districts, the private sector, non-governmental organizations and Makerere and Kyambogo universities. ILRI Uganda and Freie Universität Berlin organized the workshop (photo credit: ILRI/Kristina Roesel). In the afternoon, the lead trainer Professor Reinhard Fries (FUB) introduced the theory of the food supply chain concept followed by the practical example of how the smallholder pig value chains work in Uganda. Results from the recent assessments including a value chain map, constraints and opportunities were presented by ILRI-Uganda research fellow Peter Lule Mulindwa. Dr Jolly Hoona from the Ministry of Agriculture, Animal Industry and Fisheries (MAAIF) introduced the laws and regulations that are in place for pigs and pork from “farm-to-fork”, a talk which generated a lot of discussion as many regulations seem to be outdated, not based on scientific results, not well communicated to the relevant actors and most importantly, they lack proper enforcement. The day was closed with a lively debate on the potential of marketing premium cuts (presented by Dr Herbert Kwizera), whereby value is currently added (and profit generated) by simply cutting the right parts and presenting them well instead of selling random pork chops including lots of bones and fat. During the second part of the stakeholder workshop different pig diseases with relevance to public health as well as with practical relevance to meat inspection were presented as well as detection and management options discussed. 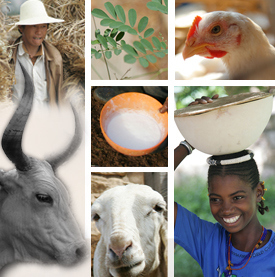 The focus was mostly on pig diseases for which we have science-based evidence from farm sampling carried out among more than 1,200 households in 2013: African swine fever, brucellosis, cysticercosis, diamond skin disease, intestinal helminths, salmonellosis, sarcoptic mange, toxoplasmosis and trichinosis. Larva of the roundworm Trichinella viewed through a microscope. 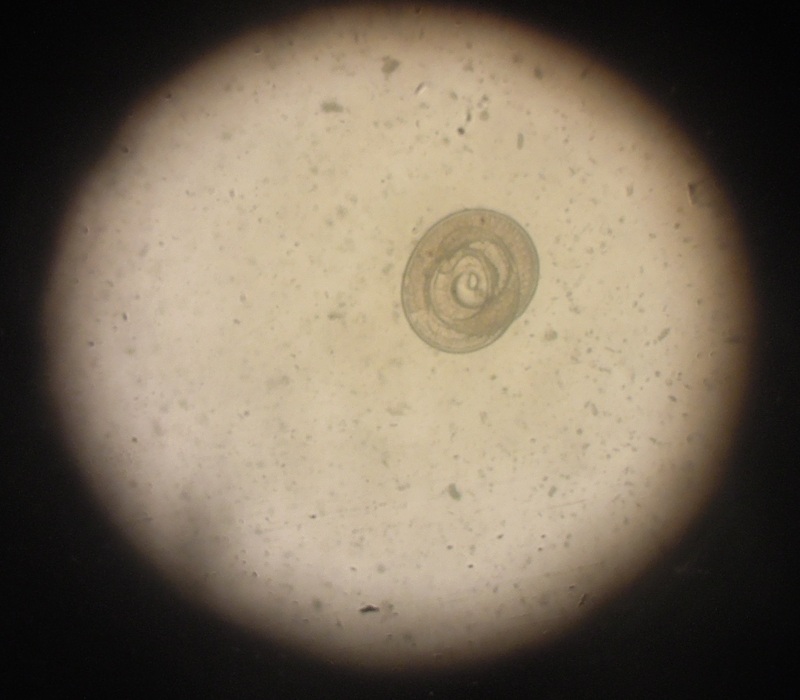 Trichinella is the smallest human nematode parasite and people can get infected with its larvae through eating undercooked pork. (photo credit: ILRI/Kristina Roesel). The stakeholder meeting was followed by a 3.5 day training of 18 practitioners: meat inspectors from each of the current ILRI study sites (Kampala, Kamuli, Masaka, Mukono districts) and the Uganda Meat Industry; quality assurance officers employed at a formal meat processor; a public health officer employed by the Kampala City Council Authority and several participants from capacity building institutions teaching meat inspection. All trainees participated in a series of lectures, discussions, field visits to the local slaughter house, butcheries and pork joints, practiced post mortem inspection and saw Trichinella larvae under the microscope for the first time following a demonstration of the so-called digestion assay, the current `gold standard´ method. The training concluded with a short progress control, and all trainees who successfully completed the training received a certificate and a DVD with all training materials and additional resources. Due to language constraints, it was not possible to have more stakeholders of the informal markets attending the workshop such as small-scale butchers, middle men and processors. Since pig meat inspection is also neglected in the formal market, this training will serve as a starting point. We hope that together with the “champions” of this training, we can scale up the training activities to the informal markets in the ILRI study sites. 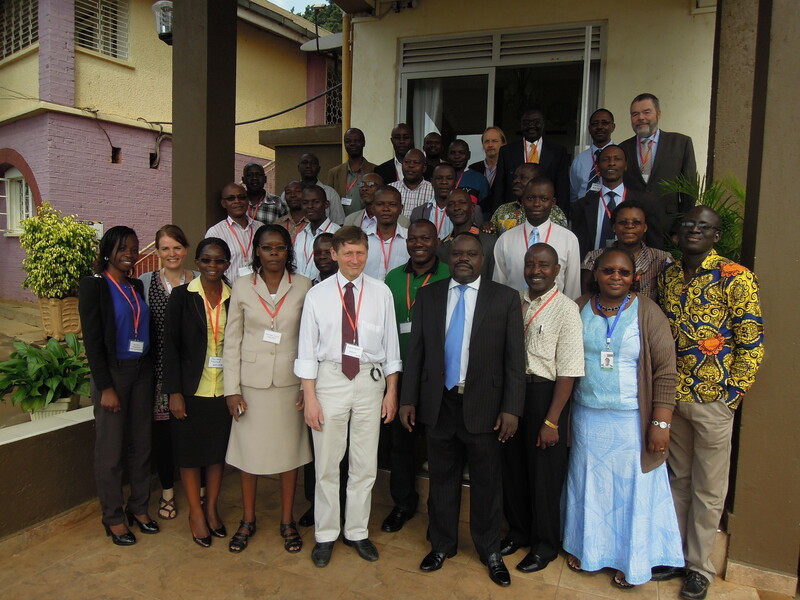 A training workshop on meat inspection was held on 7-11 April 2014 in Kampala, Uganda. Trainees included representatives from the ministries of health and agriculture, the Kampala Capital City Authority, local governments in Kamuli, Masaka and Mukono districts, the private sector, non-governmental organizations and Makerere and Kyambogo universities. As part of the workshop, participants visited Wambizzi abattoir in Kampala for practicals on ante mortem inspection of pork (photo credit: ILRI/Kristina Roesel). Tags: capacity development, food safety, Germany, informal markets, pigs, pork, slaughter hygiene, training, Uganda, zoonotic diseases. Bookmark the permalink.